My little brother is getting married next week to a lovely girl named Ashley who loves unicorns and has the prettiest mermaid hair I've ever seen. She has a very dry sense of humor that I didn't get at first. In fact my brother brought her to Thanksgiving dinner to "meet the family" and before our feast everyone went around the table to say what they were thankful for. When it came to her she smiled and said, "the moon" and that was it. I didn't know what to think but as I got to know her a little better, I started to understand how fitting, how funny and how "Ashley" that was of her. My wedding was pretty traditional and I'm happy with the way it turned out because that represented who David and I are, but I see things like this and wish I had the guts to do something really unconventional and a little bit "funky". And I wish I had listened to my mom and worn a veil but that's pretty much my only regret. No, this is not a J.Crew ad. It's just my brother and his soon-to-be wife. This post has made me feel old. They really do look stunning together! I can't see a picture of Ashley without thinking of her Halloween costume. She is a perfect Luna Lovegood. Also, with their marriage we'll have a cool circle chain of Godfrey - Craig - Bagley - Nielson/Haslip going on. How fun! I, too, wish I could get married again. I was so young the first time that I didn't really know what I was like yet. I would have so much more fun now! Ah well, at least it turned out well. I am, after all, still married. Congratulations to the happy couple, and how fun to have your whole family come to you! I absolutely LOVE that wedding invitation!! I know what you mean about feeling old. I had four 17-year-old girls come stay with my last weekend. It was fun to spend some time hanging out with them, observing them, and remembering life at 17. Talk about feeling old. WHAT! you haven't even told me this! yay! and it's the bagley girl!!!! i totally remember when they first met! I saw that invitation posted on the artist's blog this morning, another great person who I follow on my google reader. Is she related to Racheal of Cardigan Empire? Oh, and I tried the olive and goat cheese stuffed chicken and the green beans with shallot butter... very good! I don't even know Ashley but from what I know of Marcus, she just seems so fitting for him. 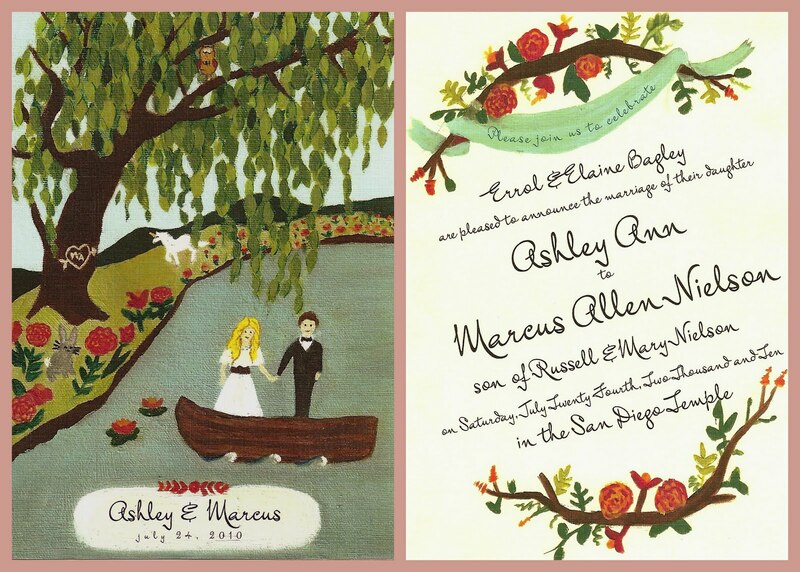 I love the invitations, beautiful, fun, and sweet. I am very happy for them. They really are such an adorable couple! I'm so happy for them! Can't wait to see pictures! Okay first, you are so cute, and stylish and I want to be your friend (don't be scared!) I came over from Nie Nie's link and have been so enthralled in your blog and life. Second here's my connection to sweet Ashley- My sister Becky is married to her brother Richard (they are older than Ashley- about to celebrate their 15th wedding anniversary). So I've known Ashley somewhat over the last 15 years, and can I just say she is every bit as cute and lovely as she seems. The Bagleys are a beautiful bunch and I have loved being somewhat connected to such a great family. Becky was trying to describe their wedding invite to me, so I'm so glad you posted it, so cool. Okay hopefully I don't come off too stalkerish, but thanks so much for sharing! Oh, also your sister-in-law Sarah is a sister of my sister-in-law Emily who is married to my brother Steve. Confusing? Anyway I love Sarah too, she is the reason I have ever even tried to quilt. Love your blog. So happy to have stumbled upon it. I too have wedding envy from time to time. My husband and I got married just 5 years ago, and feel like weddings have gotten so much "cooler" since then. While I loved how our special day turned out, there are so many fun and unique things I wish I would have done. Thanks for sharing all your great photos!